The People's Deputy and the businessman Vadim Novinsky this week appeared in attention epicenter. The initiative group of deputies suggested to take away from him the Ukrainian nationality in view of the fact that in due time he allegedly didn't finish procedure of an exit from Russian. Besides, one of large Crimean assets of the deputy, Balaklavsky mine administration, it was re-registered under the Russian laws and a descent offered cooperation not only to the occupational authorities, but also anti-Ukrainian, so fallen in love Putin, biker club «Night wolves» in Sevastopol. The Verkhovna Rada couldn't support the decision to send to the president Petro Poroshenko inquiry for deprivation of the Ukrainian nationality of the People's Deputy from «at a meetingOppositional block» , owner «Smart of holding» Vadim Novinsky. Though a moment before inquiry to the head of state supported 174 of 150 this decision of deputies, necessary for acceptance. However the speaker Vladimir Groysman, suddenly doubted that on the eve of Easter in Rada there is a quorum, and took alarm vote. It showed that at a conference hall there are only 199 parliamentarians from 226 necessary for decision-making. It is remarkable that today's vote–not the first attempt to take away the Ukrainian passport from the former colleague Yanukovych and the present partner of Akhmetov. In March deputies also tried, but couldn't send to the president the corresponding inquiry. The initiator of consideration of a question of Novinsky's nationality in Rada is the people's deputy from «Popular front» Tetiana Chornovol. She in February declared that the present oppositionist within two years after obtaining the Ukrainian nationality didn't fulfill the obligation about an exit from Russian as still I didn't receive from the Russian Federation confirming these are documents. A press - Novinsky's service denies all charges. Like, all necessary actions as - that delivery of all-civil and foreign passports of the Russian Federation were executed. We will remind, Vadim Novinsky obtained citizenship of Ukraine to birthday from the president Victor Yanukovych on May 29, 2012. The decree was issued with the formulation «for outstanding merits in front of Ukraine». After that the businessman took part in by-election in the Verkhovna Rada in the majority district in Sevastopol where by itself I won. The Balaklavsky mine administration became Russian? 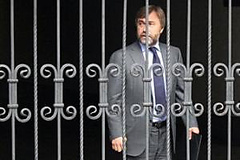 Vadim Novinsky before finding of nationality entered a top of-40 richest people of Russia. The Forbes magazine estimated its fortune in 2,7 billion dollars. Merges its assets in Ukraine «Smart holding». The sphere of interests at Novinsky: from finance and power to metallurgy and agriculture. 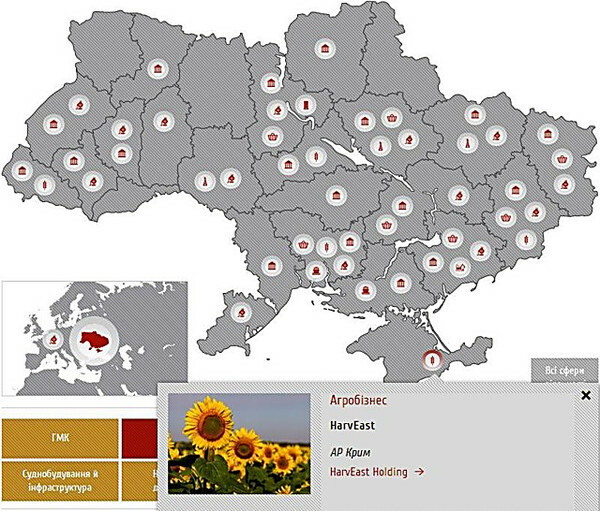 The enterprises of the businessman are located across all territory of Ukraine. 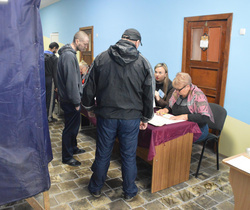 After change of the power, early presidential and parliamentary elections of 2014, at the businessman difficulties began. He received the mandate of the deputy, but it didn't become the indulgence. On March 13 at the Kiev office «Smart - Holding» I passed a search. Novinsky called it «politically motivated» , «pressure upon opposition». Among assets of the businessman and deputy the Balaklavsky mine administration in the Crimea appeared until recently, the enterprise entered in «Smart - Holding». However without excess noise, Novinsky re-registered mine administration, and now it isn't registered among assets «Smart». At least official site suddenly forgot about this enterprise at all. It from the card of assets of holding disappeared. There is information only on agrarian holding HarvEast. 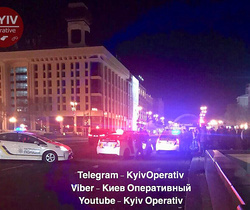 Possibly, Vadim Novinsky decided to conduct game on two fronts: being the deputy of the Ukrainian parliament, he offered the occupational authorities cooperation. It speaks so: «in view of the new political and economic conditions which developed» on the peninsula. Corresponding the message I extended a press - service of the enterprise. «Owners of Balaklavsky mine administration share aspiration of the authorities and the public of Sevastopol to ecological improvement of Balaklava…Taking into account these priorities, possibility of further development of the Balaklava Green project (the construction project of a recreational zone in Sevastopol is considered by one of the directions of perspective development of the enterprise– «Central board» ) in new political and economic conditions» ,—it is told in the message published by the Crimean mass media. 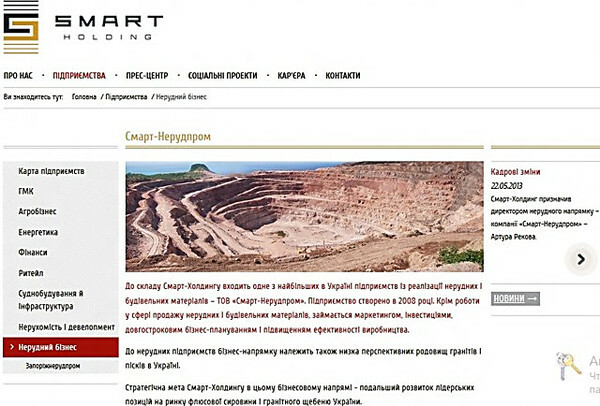 In a press - service «Smart - Holding» for some days couldn't explain that happened to Balaklavsky mine administration and where it disappeared from the corporate site. 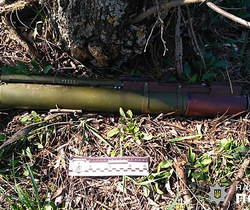 «Till Tuesday we can't comment on the Crimean assets» , - I reported «To the commander-in-chief» head of PR-of department «Smart - Holding» Evgeny Zagorulko at the very end of working week, without having explained that will change for easter days off. At the same time, one of representatives of so-called Sevastopol municipal administration whom the edition «quotes reported about the Russian registration of mine administrationVlasti.net». According to the official, sanctions and arrests of property in the Crimea didn't concern «the enterprises belonging to citizens of the Russian Federation and re-registered according to the Russian legislation». It is a direct hint that Novinsky really didn't leave the Russian nationality and any problems with business at it in the occupied territory won't be. So far in Rada there are trials concerning the Ukrainian passport of Vadim Novinsky, and in «Smart - holding» don't hurry to open information that happens to its Crimean property, the enterprise belonging to it offered «world» to pro-Putin patriotic biker club «Night Wolves» in Sevastopol. Earlier the enterprise had a dispute round the land plot near the mountain Gasfort, and now, seemingly, conflicts remained in the past. «…Implementation of the Balaklava Green project can become the powerful engine of development of all region and an important common ground of interests at the regional and federal levels, and also important factor for attraction of the Russian and international investments into the region» , - it is told in the message of the enterprise of Novinsky.